This took us by surprise: There were lots of folks at the Brooklyn IKEA on Black Friday but no frantic mobs, no pushing and (by 3:30 - 4:30 p.m.) the shortest lines we've ever experienced at IKEA! While many people were at work yesterday, we still expected more of a Black Friday-style scene. Instead, while the store was full of people milling about, the vibe was mellow and we were out within five minutes. 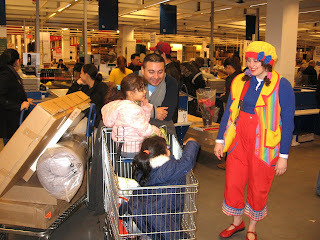 There was even a clown making kids smile near the checkout lines. Can't say this will be repeated over Black Weekend. But it's got to be better than the lines that confronted us on one horrible Saturday in August. A Brooklyn rabbi and his wife were among those killed during the terrorist attacks in Mumbai, India. The couple ran the local headquarters of the Chabad-Lubavitch movement, an ultra-Orthodox Jewish group. "He was the nicest gentleman you can imagine," said one of his mourners. You know the drill: Many stores offer get-up-early sales the Friday after Thanksgiving to kick off the holiday shopping madness. While you can often snag just as good a deal online, some outlets offer extra special discounts if you drag your self into the store at 5 a.m. -- Best Buy is one of these. Check out these Brooklyn Black Friday sales, starting with "Shop Brooklyn." Shop Brooklyn: As part of the “Shop Brooklyn” campaign, many Brooklyn retailers, restaurants, bars, and other service providers will offer special “Brooklyn Bonuses” on November 28 (“Black Friday”—now renamed “Brooklyn Friday”) and each weekend from November 23 through December 21. Complete list of participating stores at ishopbrooklyn.com. IKEA: On Friday, November 28 the water taxi and shuttle bus service will begin at 9:40 a.m. and end at 9:40 p.m. Free breakfast until 10:30. Malm queen bed frame $99; Mysa Vete down comforter, $49.99. See the whole list here. Best Buy: Doors open at 5 a.m.; tickets handed out for Black Friday specials at 3 a.m. Check the website for the doorbusters -- some items will be stocked only 20 to a store, so it's gonna be a loooong night. Here. Circuit City: Stores open at 5 a.m. Check out deals here. Macy's: Store opens at 5 a.m. Print out a $10 saving pass here. Home Depot: Opens at 6 a.m. on Black Friday. Here. Thistle and Clover: Starting Friday, November 28 at 10AM, they’re taking up to 40% off items by designers like Eskell, Rachel Comey, Tylho, Iro and Publicka. More here. Brooklyn Circus: Speed Pass for The Brooklyn Circus Black Out Sale of 2008. Savings from 50-70% off on selected items. Refreshments will be served (first come, first served). 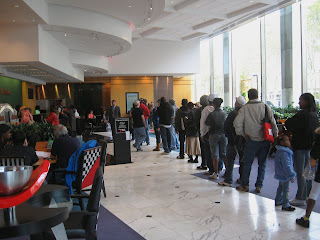 Doors open at 9am-7pm.The first 50 readers to email speedpass08@thebkcircus.com will be granted the Pass. Here. Black Friday in Greenpoint: NewYorkShitty goes into details here. About.com has compiled a list of Thanksgiving hotlines open for emergency cooking questions on Thanksgiving day. These include the famous (USDA Meat and Poultry hotline, open till 2 p.m.; and the Butterball Turkey Talk Line -- 1-800- BUTTERBALL -- open till 6 p.m.) along with the odd what-to-do-with-leftovers hotlines. All Hotlines here. In keeping with the theme of 'Buy Brooklyn,' the Brooklyn Eagle has assembled a list of holiday craft fairs taking place between now and Christmas. This is a great way to keep it in Brooklyn, get some great gifts and feel good about it, since most of these fairs support schools, local artists and other non-profit institutions. 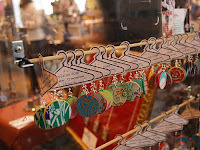 Saturday, December 6 is a big day for craft fairs, with the Brooklyn Friends Holiday Craft Fair in Downtown Brooklyn, the PS 321 Crafts Fair in Park Slope and the Children's French and Spanish Book Fair, also in Park Slope. In Greenpoint, the Hearts and Crafts Affair takes place on Dec. 6 and 7. Also on the 7th, the 3rd Ward Handmade Holiday Craft Fair looks like a winner in East Williamsburg. The weekend of Dec. 13 and 14 features three more fairs; more events will take place on the 18th and the 20th. So make your list and shop local. Full details here. Photo by Eob, Creative Commons license. 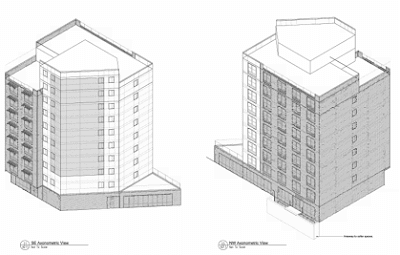 CORD reports that the Board of Standards and Appeals granted developer Stein a variance on Tuesday to build Oliver House seven stories high, as opposed to the mandates of the new Carroll Gardens text amendment which would have allowed only five stories. In July, the Narrow Streets Zoning Text Amendment was passed by the City Council, restricting Carroll Gardens building heights on defined "narrow streets" to 55 feet. It was thought that the out-of-scale building proposed for 360 Smith Street ("Oliver House") would have to shrink to a size similar to other buildings in the neighborhood. CORD says the vote was unanimous on both applications: on the completion of the foundation, which was only 20 per cent complete, and on the A application which claimed the developer would suffer substantial economic financial loss. Rumors of an H&M opening on the Fulton Mall in Downtown Brooklyn were confirmed last week, according to the Brooklyn Eagle and the Observer. Cushman & Wakefield reported that the Swedish clothing and cosmetics store will soon open on two floors at the corner of Fulton and Bridge Street, called "one of the best corner locations on Fulton Street." According to H&M, the store should be opening in the spring of 2010. "The Unusuals" -- a "one hour comedic procedural set in a New York police precinct" -- will be filming near Fulton Ferry Landing all day on Thursday, Dec. 4. According to Production Weekly, The Unusuals, produced by Topanga Productions for Sony Pictures Television, is directed by Stephen Hopkins. Producer: Peter Tolan - Merrill Karpf; Writer/ Producer: Noah Hawley. 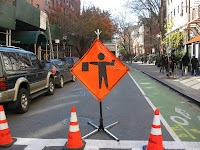 After spending a solid week resurfacing Henry Street in Brooklyn Heights (nice and smooth!) 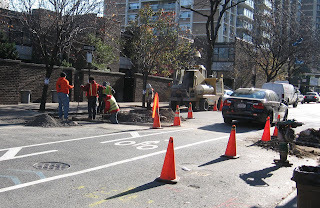 last month, work crews were out last week digging it up again. Couldn't they have thought of this before they resurfaced the road? After Gristedes and Trader Joe's, What's Next for Downtown Brooklyn? Now that Brooklyn Heights has their Gristedes back, and Cobble Hill has Trader Joe's, Downtown Brooklyn is waiting for their own spiffy supermarket. Back in March, The Real Deal reported that Freshway Marketplace inked a 15-year lease at 200 Schermerhorn (that's ground floor at State Renaissance Court, shown above) for its first NYC retail space. Brownstoner reported that the deal had fallen through. In October, however, Brownstoner got a tip that a market called Brooklyn Fare was coming in. The Brooklyn Paper confirmed the story, and the Brooklyn Eagle reported that Brooklyn Fare has negotiated a 30-year lease. Owner Moe Issa, who says he hopes to open in January, told the Eagle that the market will have "food to go, a seafood department and a butcher, a cheese bar with a selection of at least 500 cheeses, a chef onsite, a bakery and a kitchen." The Eagle also reports that "a new market will soon replace the Associated market that closed this summer at the Concord Village residential complex at Tillary and Adams streets." 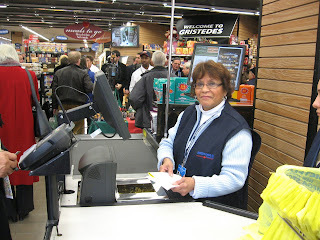 The totally rebuilt Gristedes supermarket at 101 Henry Street in Brooklyn Heights reopened in a glorious fashion Friday morning with a VIP party and actual VIPs! 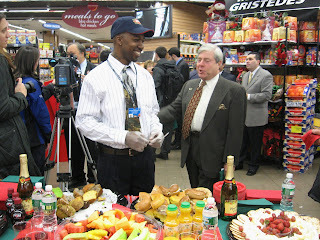 John Catsimatidis, chairman and CEO of Gristedes Foods (above), Brooklyn BP Marty Markowitz (below), Councilman David Yassky, and State Senator-elect Daniel Squadron and various store managers were among the ribbon-cutters. Half of Brooklyn Heights enjoyed free breakfast as delicious nibbles -- including fruit, bagels and lox, fresh-baked muffins and free coffee -- were generously handed out. Neighborhood shoppers' reactions were generally awestruck. 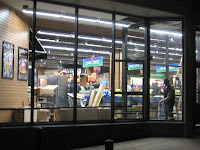 The store appears to be much larger than before last April's disastrous fire, owing to a new traffic-flow design, and the shelves are stocked with fresh, clean items. Service, at least Friday morning, was cheerful and polite. 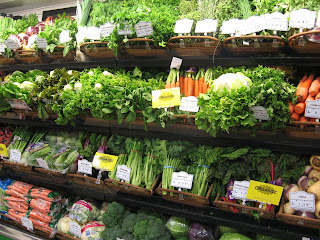 The produce department is particularly impressive, fully stocked with fresh and organic greens. 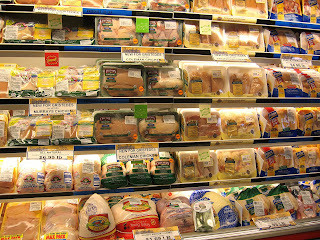 There are many more choices for carnivores than before as well -- the poultry department now carries Murray's and Coleman's organic chicken. The store has new freezer units, stocked with Lean Cuisine and other convenience foods. The deli looks pretty awesome. One drawback is the prices. We had to notice that many of the items that we generally buy seem to be about a dollar more at Gristedes than at Key Food or Trader Joe's. This probably won't deter many North Heights shoppers, especially if Gristedes keeps the store clean, the shelves stocked with fresh items and the service friendly, but it might hurt them with South Heights customers who are closer to the other stores. But we commend Gristedes on a job well done. The supermarket is completely rebuilt, modern clean and friendly. The large amount of organic items is a big plus. The greens look scrumptious. And Lydia is back! Check it out. Free coffee all week. 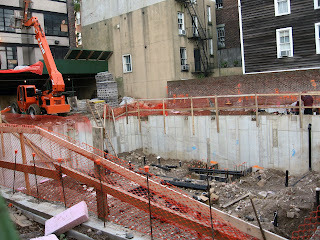 More details at the Brooklyn Eagle, the Brooklyn Heights Blog and the Brooklyn Paper. - VIP Party Friday at Brooklyn Heights' Gristedes! - Fire-Damaged Brooklyn Heights Gristedes: Pharmacy To Reopen? 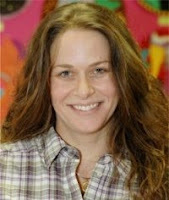 "Sadly, Ms. Rothman-Fried was six months pregnant. Her son was delivered by emergency caesarian section, but died in his father’s arms two hours later." This story has touched so many people. Our sincere condolences to her family, her husband, and all who love her. 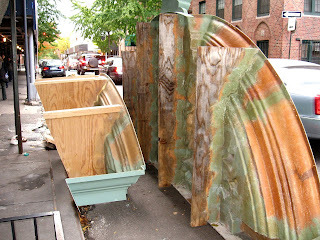 The new, "green" Galapagos Art Space in Dumbo, Brooklyn, is screening a series of short films tonight (Friday). 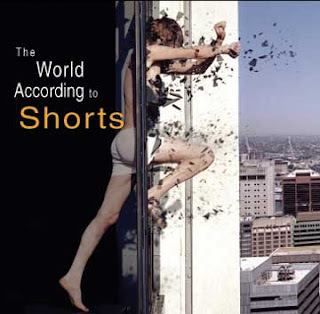 The screening is presented by New Yorker films in partnership with Galapagos Art Space, and follows their 2-for-1 Happy Hour (5-9 pm). This promises to be a "film festival in miniature," where you can get a taste of up-and-coming, innovative directors from around the globe. Workers at the Brooklyn Heights Gristedes were still scrambling tonight to get ready for tomorrow morning's VIP Grand Opening party. Expectations are high; workers are hustling, and debris is stacked up at the front of the supermarket, on Henry Street at Clark. Will the store be ready? Will the neighborhood render a positive verdict? We'll know tomorrow . . . This multifamily dwelling in beautiful Downtown Brooklyn is conveniently located near schools, subways, retail, Brooklyn Borough Hall and the Post Office. With multiple entrances and exits, the project includes a gym, laundry room, and rooftop fake rock. - A little roadside memorial to a guy killed in a motorcycle crash is causing a whole lot of controversy on the Gerritsen Beach blog. 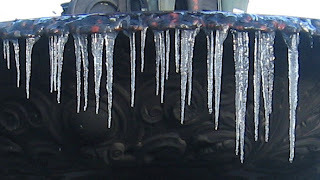 Funny how this sub-freezing weather just kind of creeps up on you. One minute you got a gushing cascade, next minute you got icicles. 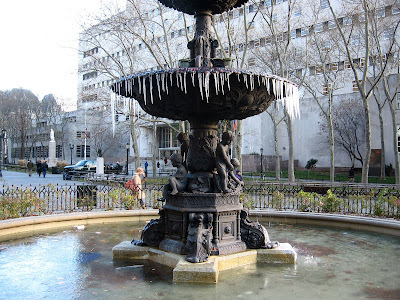 The Parks Department came out around 8:30 a.m. to turn off this lovely (but rapidly solidifying) fountain in front of Brooklyn Borough Hall. VIP Party Friday at Brooklyn Heights' Gristedes! 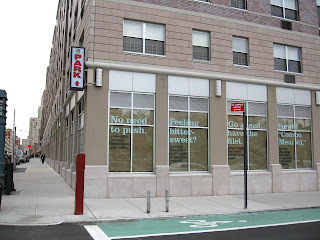 The Big Opening Day is coming up fast for the Brooklyn Heights' Gristedes! A VIP party will be held Friday, Nov. 21 from 8 - 11 a.m. All are invited to come and help celebrate the reopening. Burnt to a crisp last April 1st, the wheels of change have spun full circle and a reloaded, replenished and redesigned supermarket is almost ready to roll. 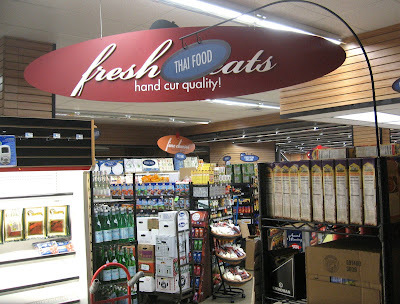 "Our newly renovated full service supermarket will include a full service Chock Full of Nuts Cafe with breakfast sandwiches and a full array of coffee selections. Our in-store bakery will feature a highly qualified baker preparing baked goods fresh daily as well as specialty cakes and pastries. 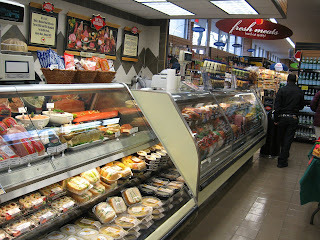 Our Deli will feature a Gristedes original Mike's Sub Shoppe with a cornucopia of fine sandwich selections. 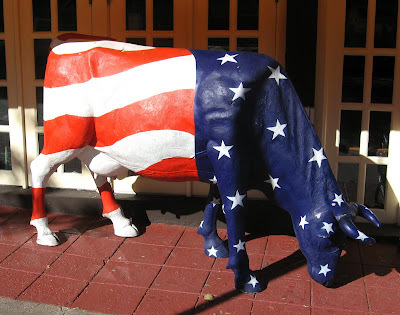 Our Deli will also feature a fresh Olive Bar, Hot Food selection, prepared Meals To-Go." 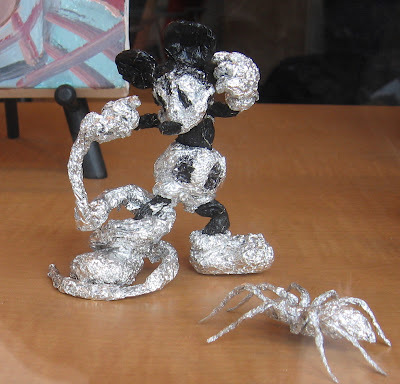 This aluminum foil Mickey Mouse bravely battles a serpent while a spider watches. The action takes place in the window art gallery of the League Treatment Center on Front Street in Dumbo. 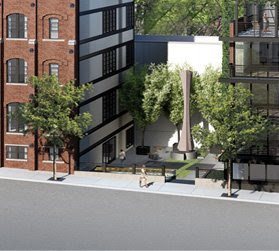 You're invited to attend a special event to celebrate the just-opened sales office for 20 Henry, a newly converted and constructed luxury condominium in Brooklyn Heights. This event will feature a live performance by Chris Washburn and The SYOTOS Band (an Afro Cuban and Latin Jazz band), along with a "winter whites" wine tastings from Brooklyn Heights favorite Michael Towne Liquors. All are welcome to attend (it's free and open to the public). Demolition of the courtyard at 20 Henry Street (Peaks Mason Mints/ “candy factory” building) -- once the site of artwork and landscaping -- is well underway. The 38 newly restored and constructed residences range in price from $580,000 to $2,560,000 and are a mix of studios, one, two, three and four bedrooms. Many residences have ceilings of over 11 feet. Sherida E. Paulsen, principal of PKSB Architects, is the lead architect behind the conversion and new construction of 20 Henry. 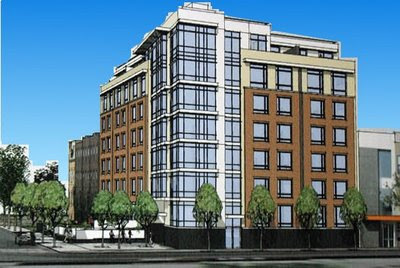 For a full list of available units and floor plans, visit: www.20Henry.com, or www.halsteadpdm.com or call the Sales Center at 866-924-7120. Open houses will be held this weekend. Correspondents chatter on Curbed about how these units will sell in this down market. According to the Brooklyn Eagle, seven apartments sold over a month ago (including two penthouses). 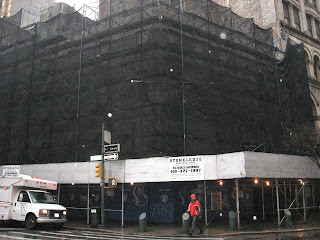 The Brooklyn Heights Blog posts more about the history of 20 Henry and its planned amenities. 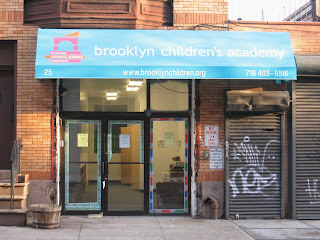 Andy Lewis, the man who defrauded a school full of parents out of their tuition money when he closed down his shoddy Boerum Hill preschool (Brooklyn Children's Academy Preschool, or BCAP, seen left), was arrested last Wednesday on charges of defrauding the government out of half a million dollars. 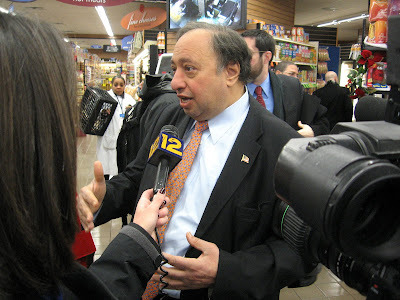 According to two stories in the Brooklyn Eagle (here and here) and in other papers including the Daily News, the NY Post and the NY Times, Lewis defrauded the Department of Agriculture’s National Child Food Program of more than $500,000 in funds that were supposed to have been used to feed children participating in after-school programs run by Lewis' questionable umbrella organization, Better Brooklyn Community Center (BBCC). This shouldn't surprise anybody: According to a series of stories over the past year in the Brooklyn Eagle, Lewis also neglected to pay his teachers or his landlord, and he opened up his preschool at 25 Dean Street without a license. Back in February, Lewis told Councilwoman Letitia James that he couldn't return parents' tuition and deposits because he was flat broke. According to the Eagle, Lewis owes parents anywhere from $70,000 - $100,000. The Daily News says he cried at his court appearance. A fine move, but bail was still set at $100,000. Should be no problem for a guy who allegedly pocketed $500,000 meant to feed low-income Brooklyn children. We've returned from our trip to my mom's funeral. Thank you all for your kind words and support. It constantly amazes me how many positive people there are in this world. Hi folks. My dear mom died and we'll be traveling a distance to be with my family for the rest of this week. Thanks for your understanding. I hope to start up again when we get back Tuesday. 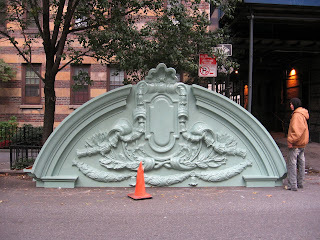 This impressive facade decoration is meant to grace the front of 161 Henry Street in Brooklyn Heights. We actually took this photo on Oct. 29 and wanted to wait for the "after" photo, but fate has decreed that we post it now, without seeing how it all turned out. 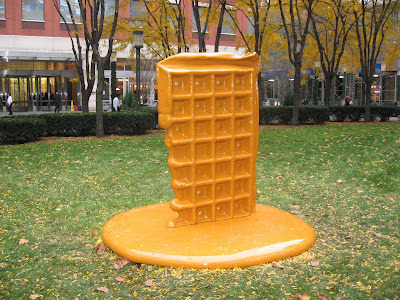 This giant waffle – entitled “Waffle (rendering)” by Martha Friedman, is part of the Public Art Fund’s exhibition “Trapdoor” now showing at MetroTech in Downtown Brooklyn. Trapdoor features works by Ethan Breckenridge, Martha Friedman, Sara Greenberger Rafferty, and Francis Cape. For more about this show, visit the Public Art Fund website. "We are looking for artists, cooks, friends and neighbors to join us for SOUP KITCHEN, where for as many days as we have volunteers, we will be offering a "one-pot meal" to all on a first-come, first-served basis. Unique dishes from any ethnic tradition are more than welcome. 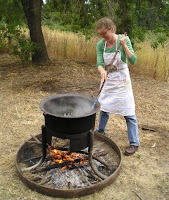 We will provide cookware, utensils and help with logistics. We ask that you supply the love. Folks from the other boroughs are jealous about the short lines and easy access to theater tickets Brooklynites have at the Downtown Brooklyn TKTS booth at 1 MetroTech (just off Jay Street). Now it's open Saturday instead of Monday, which makes a lot of sense, since most shows are dark Monday. The Theatre Development Fund sent us an email saying the booth will now be open from Tuesday - Saturday, 11am to 6pm. TKTS Downtown Brooklyn offers Broadway, Off Broadway, music, dance and Brooklyn performing arts events at discounted prices. 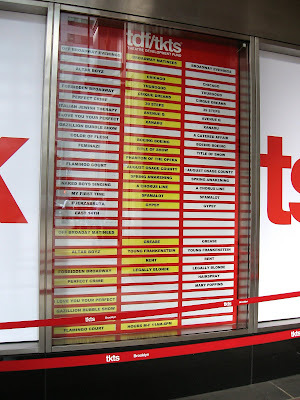 TKTS offers same-day evening and next-day matinee tickets (i.e., Wednesday matinees sold on Tuesday; Saturday matinees sold on Friday and Sunday matinees sold on Saturday) at discounts of up to 50% off for Broadway and Off Broadway productions. As an added service to the Brooklyn customers and to help performing arts groups in Brooklyn, TKTS Downtown Brooklyn offers tickets to events in Brooklyn for the full week in which an event performs. There was such a good response to this event last year, we're trying to spread the word: The Brooklyn Friends school Winter Crafts Fair will take place on December 6 from 10 a.m. to 5 p.m. at 375 Pearl Street in Downtown Brooklyn right next to the Marriott Hotel. This is the ultimate fun holiday event -- and a great way to Buy Brooklyn! 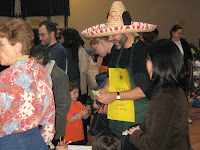 While the main event features 45 local artisans selling unique holiday gifts, the Fair offers locally produced food, carnival games, a book fair, and all-day entertainment for children and families. And you can feel good about it, because proceeds benefit the Horizons at Brooklyn Friends School, an academic enrichment program the school provides for children at PS 307 and PS 287 in Fort Greene. Kids will enjoy: bouncing rides, face-painting, and carnival games, old-fashioned holiday crafts, and building life-size Gingerbread Men. There will be strolling singers and a student jazz band, and a professional photographer's booth, composting and karate demonstrations, winter wreaths and plants, and more. Childcare is available so that parents can shop. 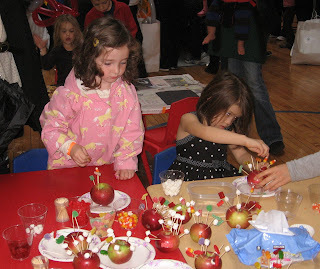 A complete Winter Craft Fair preview is on the school website. The petting zoo and children's rides were rained out fairly early Saturday, but the action moved inside and the Plymouth Church Yankee Fair in Brooklyn Heights attracted big crowds eager to shop for holiday presents and enjoy kids' programming. 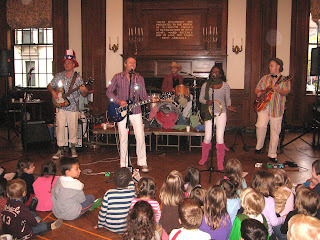 Besides all kinds of new and used merchandise to buy, there was an exotic creature show out on the lawn and an excellent band led by John Carlin inside, which attracted a huge crowd of kids. Talking Hands Theater puppet ensemble and Liam the Magician also performed. The used book and CD fair was a hit. By the end of the event, people were carrying out bagfuls of loot. On Cranberry Street, this is one of those neighborhood fairs that locals go to year after year, like the Brooklyn Friends Winter Crafts Fair (coming up December 6). 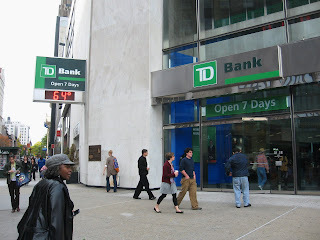 We recently blogged about TD Bank, which has taken over Commerce Bank. Now we have received word from TD Bank that they have presented Brooklyn's CAMBA Housing Ventures (CHV) with a check for $100,000. CHV will use the grant award towards developing a 53-unit affordable housing development at 97 Crooke Avenue in Flatbush. "97 Crooke Avenue will offer affordable and supportive housing to both lower-income community residents and formerly homeless individuals exiting the City’s shelter system," Joanne M. Oplustil, Executive Director of CAMBA, Inc. "This beautiful building will provide . . . on-site case management, community rooms for tenant and community use, and a landscaped back patio and garden." Of the 53 units, 20 units are targeted for individuals earning no more than approximately $30,000 and 32 are reserved for formerly homeless individuals exiting the New York City Shelter system; 1 is reserved for an onsite superintendent. CAMBA staff will provide on-site case management services, group facilitation and recreational activities. More at the CAMBA website. More at TD Bank. Photographed left to right: Joanne M. Oplustil Executive Director at CAMBA, Beverly Morris, President of CAMBA Housing Ventures, Peter Meyer, TD Bank Market President for NYC; Brooklyn, Queens, the Bronx, Staten Island. Tolls on Brooklyn, Manhattan, W'brg and 59th St. Bridges? The MTA is going to reveal Monday just how much in the red it is -- and unnamed sources tell CBS (see video, above) that the news is grim. Putting tolls on some or all of the East River bridges -- the Brooklyn, Manhattan, Williamsburg and 59th Street Bridge -- is part of the bailout plan being considered. Since both the city and state are basically broke, New Yorkers are also looking at fare increases, budget cuts, tax increases, and congestion pricing. More details in the NY Times. Police searched the Brooklyn Borough Hall fountain and the ground around it by flashlight about 7:45 Thursday night, looking for a heavy object that was allegedly used to attack a passerby. The guy seen sitting on the bench in the bus shelter -- with his hands cuffed behind his back -- was accused of hitting a man in the head with the object. 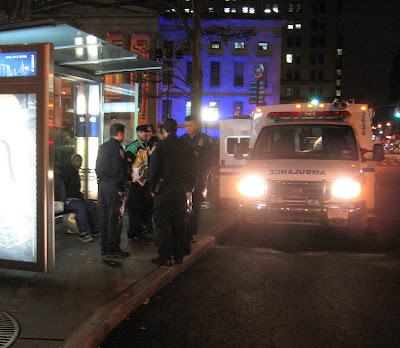 The victim of the attack was loaded into the ambulance seen here. The extent of his injuries aren't known. Four police cars with uniformed officers -- and what appeared to be several plainclothes officers -- were at the scene. 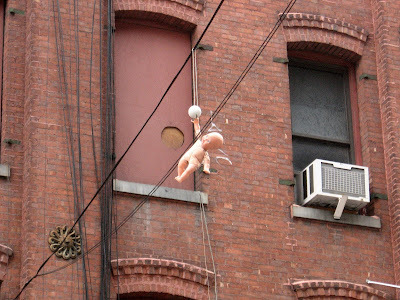 Looking like a tattered little angel, this doll was thrown over some overhead wires like an old pair of sneakers, on Pearl Street in Dumbo, Brooklyn. 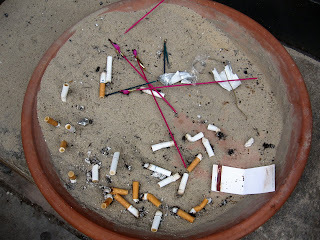 The grungy remains (cigarettes and bottle rocket stems) of Tuesday night's Obama party, outside the Water Street Restaurant and Bar in Dumbo, Brooklyn. Commerce Bank disappeared on Montague Street in Brooklyn Heights Saturday, as it did at 575 other locations. Green signs bearing the unfamiliar TD brand were quickly installed, and thank goodness, the clock was returned to standard time. It had been stuck in military time for weeks, and we were getting pretty tired of translating 1800 hours into 6 o'clock. So who is this TD, and what happened to Commerce? "Headquartered in Portland, Maine, and owned by TD Bank Financial Group of Toronto, Canada, TD Banknorth bought Commerce's parent, Cherry Hill, New Jersey-based Commerce Bancorp in March for $7 billion." According to a press release published in MarketWatch, the bank may have a new name, but "the brand positioning as 'America's Most Convenient Bank,' with its legendary focus on convenience and service, remains unchanged." The legendary lines remain unchanged as well, we notice. Thank goodness the legendary change machine is still working! This is where we bring in all those pennies that we have been collecting to pay off our credit cards . . .
New Yorkers were told by Mayor Bloomberg today just how hard the crumbling economy would hit NYC residents: he is proposing new taxes (both sales tax increases and a huge income tax hike), layoffs (the city is aiming to cut 3,000 from the workforce), attrition, possibly 1,000 fewer cops hired, a 7 percent property tax hike (kiss that $400 rebate check goodbye), and even more school budget cuts. Under the Mayor's plan, libraries would cut a half day of service; five fire houses would cut nighttime hours. Protective Specialist slots -- 127 of them -- would not be filled at the Administration for Children's Services. Health and dental care for children would also be cut. The City faces a cumulative $4 billion budget gap for 2009 and 2010, in spite of fiscally sound planning by the famously prudent Bloomberg. Surplus funds generated in 2007 totaling $4.6 billion were used to help close budget gaps in 2008, 2009 and 2010. MSNBC live video stream with election results. UPDATE: Election live feed now closed. Thanks for watching! The line at 8:30 this morning at the District 104 polling place was out of sight. It stretched from Johnson Street, around the court house to Brooklyn Borough Hall. People, dressed for work, brought newspapers, coffee. The attitude was "We're not going to work until we vote." Remember -- don't wear any campaign items like buttons or shirts, and don't carry campaign material, or you will be turned away. Bring a photo ID. If you have any trouble at the polls, call 866-VOTE-NYC. Is 1 Brooklyn Bridge Park Dead in the Water? After only a third of the units at 1 Brooklyn Bridge Park were sold, sales have essentially stopped, according to an analysis of a Bloomberg report by the Brooklyn Eagle. "No one really knows how long the 'drying up' period will last, and therefore the unsold units," according to the Eagle -- but the implications for Brooklyn Bridge Park, slated to be supported by revenue streams from the real estate plopped down in the middle of the park, are not good. Here's a list of every election party we can find in Brooklyn. More are popping up every minute. Got a party? Send it in! 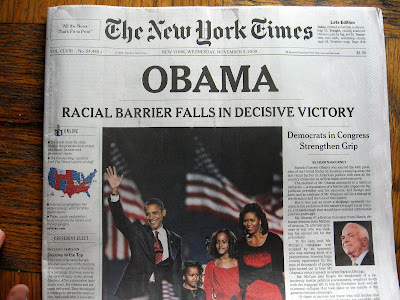 - Galapagos Art Space presents the Obama-Fabulous Election Night Party-- Results projected Live on a 14x12 Screen! ~ with ~The Yes We Can!-Can Girls; A Presidential kissing booth; Santa Claus will make an appearance; Free doctor's notes so you can go to work late the next morning! - Pacific Standard has only 15 tickets left for election night party featuring state-related $2 off deals, e.g., "if Obama wins Virginia, Dogfish Head beer will be $2 off for the next 30 minutes." - Join SuperVegan in Fort Greene for their election night party with discounted drink specials like Joe The Plumber Cocktails and munching on yummy vegan grub at Red Bamboo Brooklyn, from 8 p.m. on. - 3rd Ward Election Hoedown in East Williamsburg. - Don't even think about wearing campaign buttons, hats or shirts near the polls. The Civilians want to hear from you. Brooklyn is changing fast. We are creating BROOKLYN AT EYE LEVEL a theater show inspired by interviews about the transformation of Brooklyn and the controversial Atlantic Yards Project. If you have something to say about the communities surrounding the proposed project (Downtown, Ft. Greene, Clinton Hill, Crown Heights, Prospect Heights & Park Slope), we want to listen. We want to talk to long-term residents, recent arrivals, players in the Atlantic Yards story, as well as those who work or live in the area. Eager to hear from all perspectives. If you want to be interviewed send us an email with a little information about yourself to Michael Premo, Project Coordinator: Premo(at)thecivilians(dot)org. 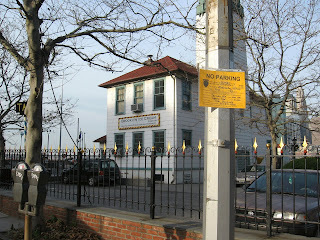 For more information: www.brooklynateyelevel.org . These interviews will be performed along with original music and dance by Urban Bush Women live at the Brooklyn Lyceum, December 4th – 7th. UPDATE: We were all excited for a while to hear that Dan Kaufman -- the notorious restaurant manager who passed himself off as an owner of The Busy Chef eatery on Henry Street in Brooklyn Heights -- pled guilty to some of the charges leveled against him. But now it's time to eat crow -- a commenter pointed out that there might be two Dan Kaufmans -- and indeed that is the case! Dan Kaufman number 2 pled guilty to similar charges -- but on Staten Island, not Brooklyn. Brooklyn's Kaufman, charged with identity theft, falsifying business records, grand larceny and attempted identity theft, will be seeing the judge on December 26. Thanks commenter number 2, for setting the record straight. And now it comes to our attention that there is still another Dan Kaufman, scheduled to come before a judge in Manhattan in April! Background: Kaufman was arrested in July. His activities are credited with driving the Busy Chef -- along with its sister stores, Blue Pig ice cream shop, Wine Bar, Oven restaurant and Busy Chef Court Street -- out of business. In addition to the $25,000 that Kaufman allegedly stole from customers, he also allegedly took much more from the business itself, falsifying the books to cover up the losses. 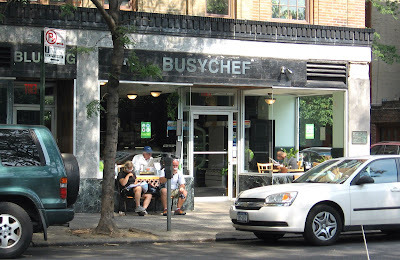 - Busy Chef Empire: Frozen Dinners or Homemade Cuisine? Note to job seekers: We've noticed a tightening of the job market in Brooklyn just in the past two weeks. So, breaking with tradition, we're also listing some part time/ temp jobs at the bottom of our job listings. - The Brooklyn Marriott is looking for an accountant, a guest services rep, a maintenance engineer, a housekeeper and a security guard. Marriott. Photo by MikeColvin82, Creative Commons license.